Do Not Use Overtime as a “Performance” Award! Reality: “Overtime” is that necessary evil businesses have to face when a critical job simply needs to get done and it can’t be done within a normal allotted period of time. Yes – employees like overtime because it means more money in their pockets…and companies hate it because it cuts into their bottom line profits. So do not get into the habit of viewing overtime as that “extra something” you can provide an employee for doing a great job. Its sounds like a no-brainer, doesn’t it?…yet, I recently came across a manager who told me just that – he wants to use overtime to reward certain employees. As he went on to explain, the red flags started popping up like crazy! 1) You will begin to view those employees that can’t work overtime as “non-committed” and even lazy. It’s a quick judgment call managers tend to make without taking into account the reasons why some employees simply can’t work more than those 40hrs a week you originally hired them for. This manager actually told me he saw no problem with cutting back on the hours of the employees that wouldn’t volunteer in order to give more overtime to those that would! 2) You will tend to play “favorite” with certain employees who are always volunteering to work overtime. This doesn’t give others the chance to earn some overtime or show you how they can be a dedicated employee. 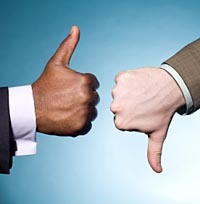 Think about it – its typically a factor brought up during an employee’s performance review. They become resentful when you point out how they never went “above and beyond” the job…yet, you may be to blame – not them. 3) Interactions between the employees you “award” overtime and those you do not will become increasingly tense and volatile. But here we go again – you as the manager will blame the employee for their reaction to the environment that you created. Money is one of the biggest driving factors in employee performance and job satisfaction…and nowadays, all employees want to make more money. But, be smart about how you go about coming up with “creative” ways to make that happen. A reward for one should never be balanced out with a punishment for another. Previous postShame on Companies for NOT Hiring Veterans! Next postIf Its On the Internet, It Must Be True! I completely agree with your thoughts. I have been told before “you are eligible for overtime” as if it were a gift. I don’t mind working extra when necessary but when I work longer it means less time with the ones that I love. They are the real reason I go to work. Shhhh. Don’t tell anyone.